These patterns are copyrighted © 2005 by Guy Cramer and Timothy R. O'Neill, All Rights Reserved. Patterns may only be used only with permission. 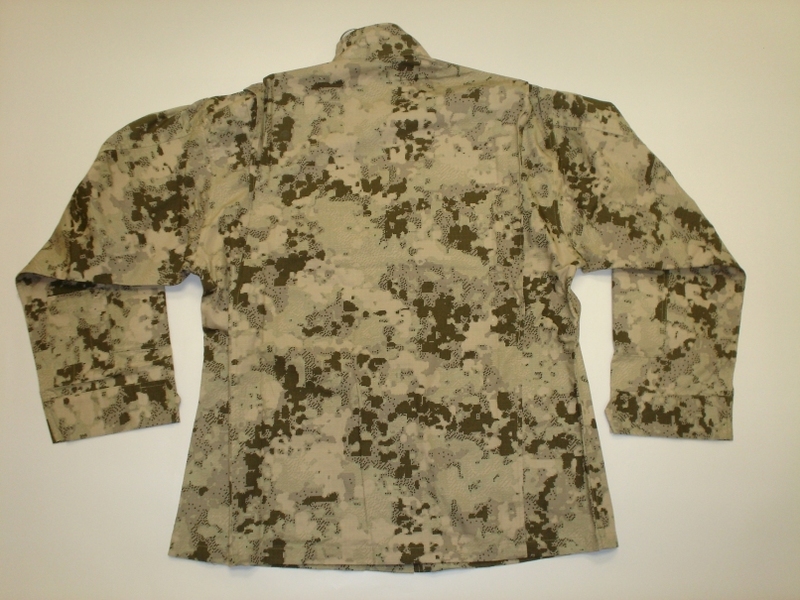 MARPAT (U.S. Marine Corps Pattern) was developed based on research from Lt. Col. Timothy R. O'Neill, Ph.D. (U.S. Army, Ret.) considered to be the foremost expert on camouflage in the world. CADPAT (Canadian Disruptive Pattern) was developed a number of years earlier than MARPAT but also cities O'Neill's work as the basis for the digital pattern. 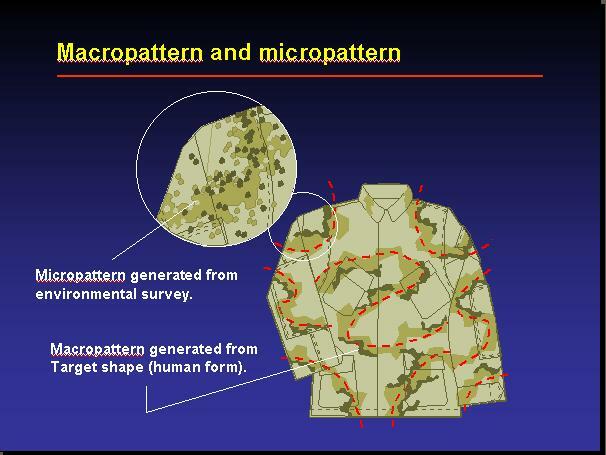 While both patterns and the new ARPAT (U.S. Army Pattern - three color variant of MARPAT) factored in Lt. Col. O'Neill's ideas of the pixalated micropattern, his research on the symmetry disruption of the human target shape with the larger Macropattern was not implemented into any of these patterns. These photos below show the SpecAm woodland pattern under different lighting conditions. Note the combination of Lt. Col. O'Neill's recommended pattern lines and Guy Cramer's fractal pattern (geometric feedback loop) elements. You may need to blur your vision to see the ambient vision effect. Effective camouflage is not just common sense. Proper design and development require a knowledge of how the eye and brain work. Dealing with a target involves two steps: detecting a target and recognizing the target. •When we detect a target, we are simply spotting something that does not belong. It may be a valid target (“detection”) or it may not be anything of interest (“false alarm”). •Two parallel visual systems deal with detection and recognition; was can call these the focal and the ambient. 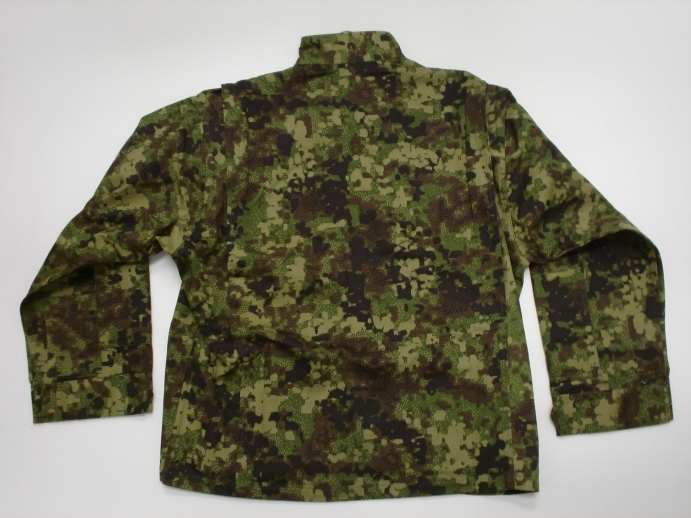 •Understanding how these processes work is essential to understanding camouflage. •The ambient system is an ancient way of seeing, one that evolved long before the focal. It has been described as the “where is it?” system, and has a distinct anatomical pathway (the tectopulvinar). It draws most of its information from the area around the center of vision, and is critical to detection. •The focal (“what is it?”) system is clustered near the center of vision. Once something has been detected by the ambient, the eye moves the focal system on the spot to decide what it is. This is the recognition step. 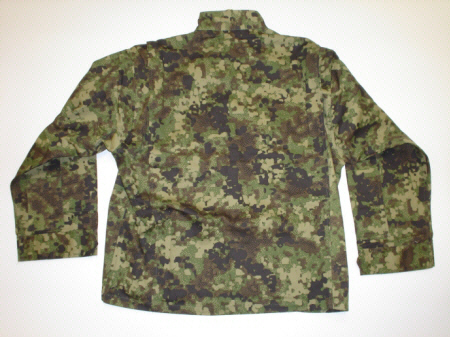 "Digital" camouflage is actually a misnomer, based on the superficial resemblance of these patterns to quantized or coarse digital images. In fact, the patterns of squares (or whatever shape we use) is employed to model the texture of typical backgrounds using a mathematical function. We could use hexagons or shapeless blobs as well, except that it is easier to render complex patterns by computer using squares. It is easy to misunderstand the purpose and mechanisms of this kind of design, which is why so many measures that try to use the approach without insight fall short. This page and information © Copyright 2005,Guy Cramer,Timothy R. O'Neill, All Rights Reserved.